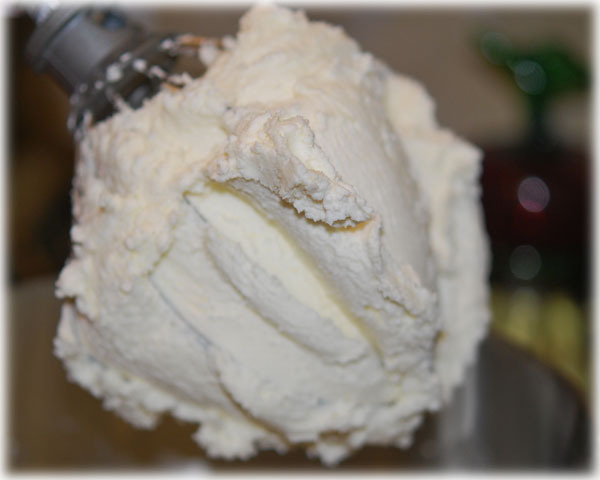 Cream butter (or margarine) until soft. I use my big stand mixer. I am sure I used a hand mixer when I first made these since I didn’t have a stand mixer until later, but I know I burned a few hand mixers up in my life (one making divinity I recall because it was pretty spectacular and threw out pieces–you’ll hear about it when I blog my divinity recipe) but maybe also doing this recipe. 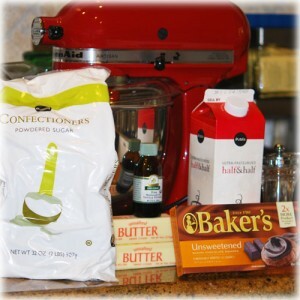 I recommend a stand mixer if you have one or can borrow one. I think Jordan probably erred by letting his butter get room temperature. I just chop it up a bit and then start creaming it. You don’t want it too soft or you will have trouble with it being firm enough. Gradually add the sugar and half and half until you have a firm consistency. Let me say here that this time I ended up only using 2 lbs of powdered sugar and about 7 tablespoons of half and half. This is one of those recipes you just have to sort of go by ear (or feel–don’t use your ear literally) on. Remember, you are going to have to make little balls (or big eggs) out of this stuff and then dip it into warm chocolate, so it’s going to have to be something like the consistency of clay. Add vanilla and salt and blend. Once you reach a stiff consistency that holds together, like the photo on the right, you are ready to form your eggs or jets (or a combination of both). You can either make a second batch and color that batch with yellow for the yolks, or you can color half of this batch yellow, depending upon how many eggs you want to make. 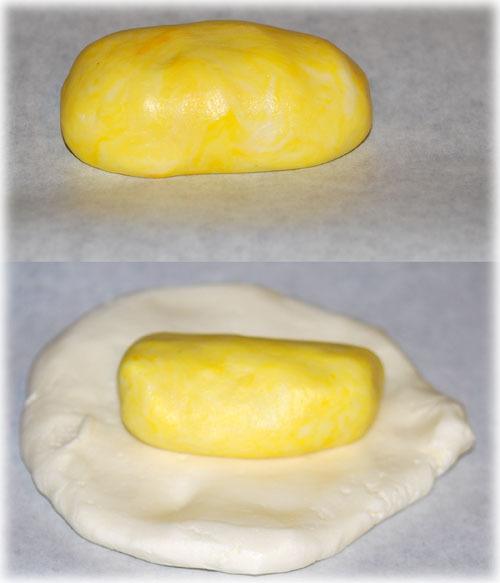 To make eggs, simply roll a cylinder of yellow and then cover it with white. Smooth it out, so that the seams are blended. After it is finished, when it is cut, it will look like a boiled egg, with the white and then the yolk. You can make them rounder if you want. If you make them longer there is just that more much more egg cream and chocolate goodness to cut into and enjoy! 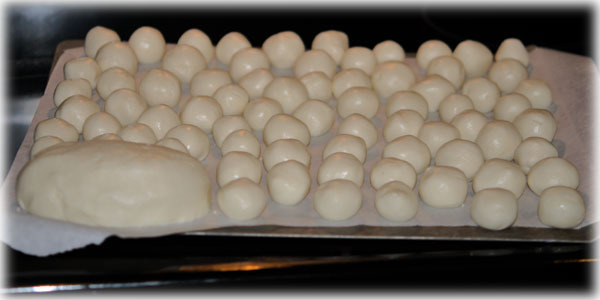 To make jets, roll the buttercream into 1 inch balls. This takes awhile, and you should plan to put some of them into the refrigerator to stay cold while you are working on the others. I also find it’s a good idea to chill the tray you’re using beforehand as it will help keep everything nice and chilly. 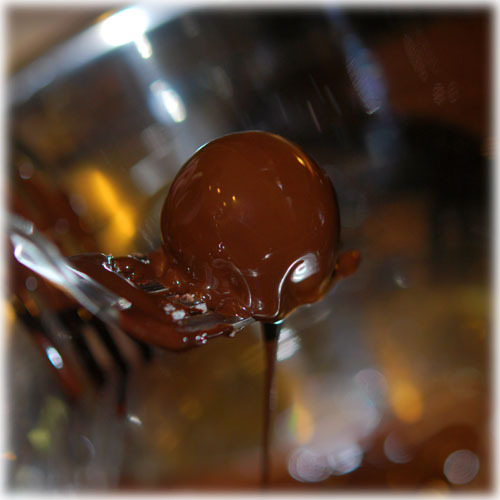 After you have your eggs and/or jets made, they will need to chill thoroughly before you dip them in the melted chocolate. Go do something else and let them chill for an hour or more. You can even freeze them. 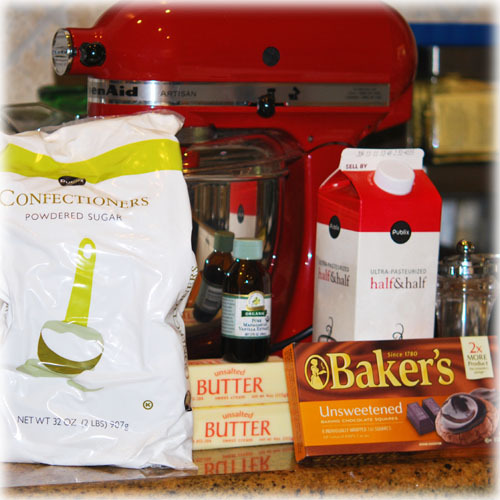 When your buttercream creations are chilled, melt your chocolate in a double boiler. If you don’t have one, fear not. Take a metal mixing bowl (I don’t suggest using one with rubber on the bottom!) 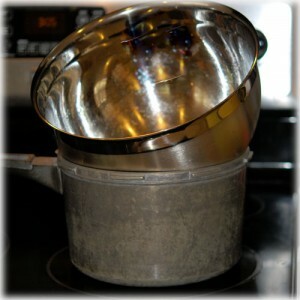 and put it over a pan of water, it works just fine–just be careful not to fill the pot of water too full or turn it too high and do monitor it. Remember, hot things can burn you! I know this isn’t pretty, but it works. I have had this old pot (it’s part of a pressure cooker) forever, it was my Mom’s and I still use it all the time. I ended up melting an entire package of baking chocolate, and going back to the store for another box and using about half of the second box, so you should buy two boxes. You can start with one box of melted chocolate and add more as you need it. What you don’t use can be poured into a small bowl and allowed to reharden and used later for something else–it’s great grated into coffee! 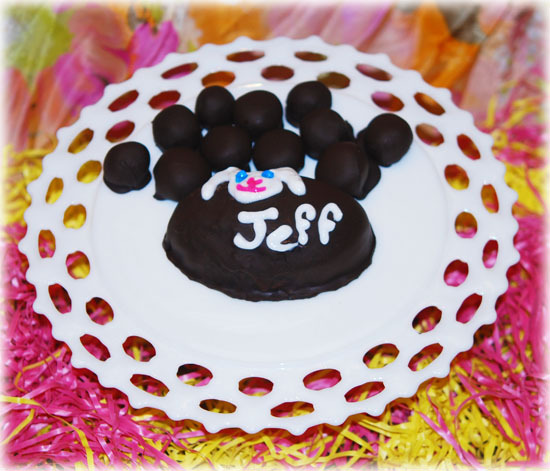 Once the chocolate has melted, dip your egg(s) into the chocolate, using 2 forks to hold onto it, let it drip, and then set it on a chilled tray covered with parchment paper or foil. Jets work the same way, except you only need one fork and remember that the chocolate is hot and you need to keep the jets and cold as possible. Take only a small number at a time out of the fridge or freezer and put them back in when you finish dipping them a batch at a time. And don’t make a mistake I made years ago, thinking you could just dump a bunch into the melted chocolate and then fish them out. No. Bad idea. Don’t do that. This is tedious, but worth the effort. If you can draft someone else to help, do so. Promise them half the batch if you must. Look at that chocolate. MMMM. When you have finished with your jets and/or Easter Eggs, they should all go into the fridge to chill until you need them. These need to stay cold unless they are being eaten. 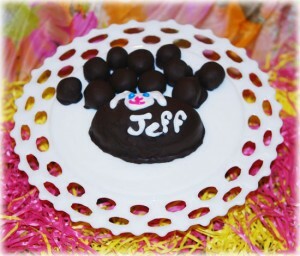 Oh, and the little prints from the forks on the Easter Eggs are bunny paw prints. Really. These are wonderfully delicious but really rich and sweet. You can pop the jets into your mouth and just enjoy them. But the best way to eat the eggs is to slice them. They are really pretty, because you can see the white and the yolk, and they really do look like an egg. 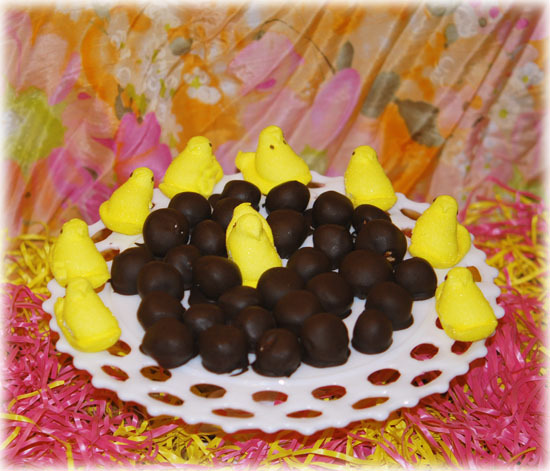 The only bad thing about these is you really can’t ship them, but you can make them and have them around during the Easter season for friends who drop by (and this might increase the number of people who decide to drop by!) and heck, why wait til Easter anyway?! These look so great, and so much better than mine. I may have to try again! After tasting them I’m pretty sure we always made them with butter instead of margarine. That must have been a later change. Wow, love the story behind them and they look fab. Love that Jordan is doing family recipes. I have a grandson called Jordan. He’s 11 – but not much of a foodie, I don’t think. I’m so glad to have found this! My boyfriends mom used to make these every Christmas as part of her cookie and candy making. I haven’t had one in 15 years and have been searching for a chocolate candy called a “Jet” for awhile now. Not letting this one slip by. Thanks! I am so glad to have been able to help! These are so delicious and I’ve never seen them anywhere else (altho I’m sure there are other recipes, I’ve just never looked since we have this one!) Enjoy! I love seeing this again. It is my new Easter tradition! My grandmother & mother made these at Christmas for many years. Mom added black walnuts in the little balls and yes the balls would look a little lumpy) but oh soooo good. My grand mother did half with black walnuts & half with chipped up maraschino cherries. 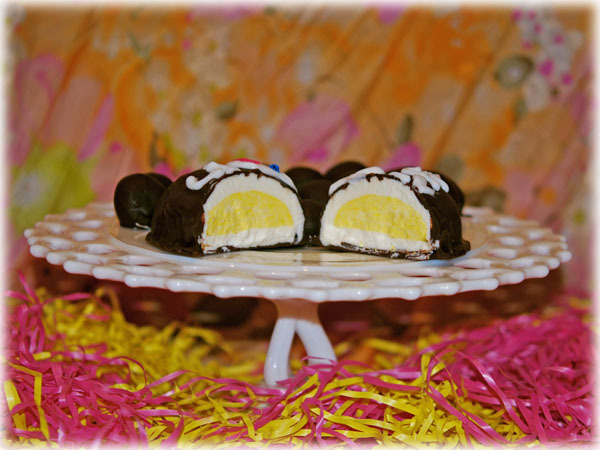 The recipe was used at my Grandmothers church at Easter time to do Easter eggs as a fund raiser. Saw a recipe on line that dips them in semisweet chocolate…MISTAKE is all I can say. 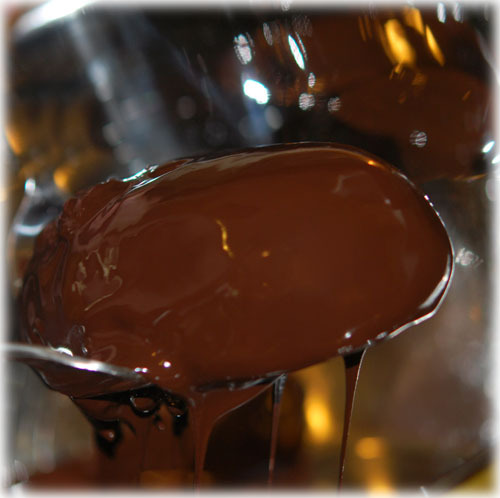 A few slivers of paraffin in the melted chocolate gives them a nice glossy appearance. Lucky us and lucky neighbors of ours. Happy Holidays! Sorry I’m so late replying! I think walnuts would be wonderful in them but my husband hates nuts in things. However cherries, who doesn’t like that! I have a fudge recipe I’m going to blog soon with cherries in it too. I’m suddenly very fond of them. 🙂 And yes, I think one year I tried sweeter chocolate and they were just TOO TOO sweet. Even for me. I know that people used to use paraffin in dipped candies but it always worried me. Here is an article about substitutes. 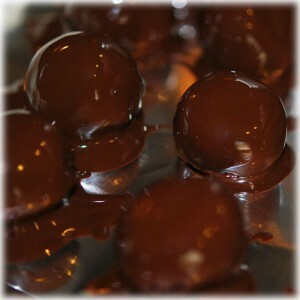 I think I’m going to try tempering my chocolate. It seems like something I could make a big mess of! I hope you’ll stop back by. Thank you for the input and ideas!